Actor Li Zonghan with his calligraphy. A search for the perfect calligraphic title for new film Reign of Assassins was launched Monday in Beijing, with the distributors inviting entries from artists across the globe. "We want to raise public awareness of traditional Chineseculture by collecting beautiful calligraphy for our film title and finally choosing one as our official calligraphy for our posters and all other marketing materials," Li Ming from HTV Film explained. According to HTV, several people were asked to enter the competition before its official launch and over 100 cal-ligraphers from 10 different provinces are already onboard. The film's leading actor Li Zonghan has also submitted an entry. "Calligraphy is my hobby, I never thought I could show my humble calligraphy by these means, I'm so happy that I could get involved in this film by my professional acting and my hobby," Li Zonghan said. Directed by John Woo and Chao-Bin Su and starring Michelle Yeoh, Woo-sung Jung, Wang Xueqi and Li Zonghuan, Reign of Assassins is set in ancient China and focuses on skilled assassin Mei Yu (Yeoh) who is in possession of a Buddhist monk master's remains. She begins a quest to return the remains to their resting place. 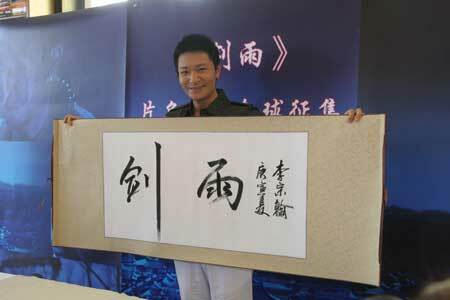 "It is a very Chinese story, therefore we need beautiful Chinese calligraphy for the film title," Li Ming explained. The film is currently in post-production with plans to screen at Venice film festival early September and hit Chinese cinemas later that month, according to HTV. Details of the competition can be found on the film's Sina blog.